There’s one thing the people of Shanghai just can’t get enough of—brunch! When making weekend plans, it goes without saying that a boozy brunch will be thrown into the mix. Whether you’re an English teacher looking for a cheap eat-and-go to burn off the hangover before your first class, or the CEO of an international corporation seeking a relaxing meal with the family, Shanghai has it all. 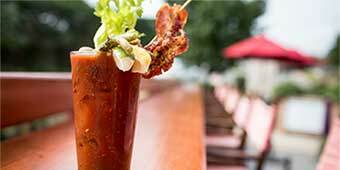 While it’s easy to find a list of standard brunch destinations online, we have listed some of our favorite, most unique brunching options in the city. Just when you thought Mexican food couldn’t possibly be any better, Maya came knockin’ on the door. Maya’s Mexican brunch is la bomba of all brunches: Pan de maiz huevos benedictos, blackened fish tacos, huevos divorciados, and the bottomless margaritas and sangria are to die for. It’s a little on the pricy side, but you can rest assured you get what you pay for. Plus, you won’t have to worry about getting bombarded by a hoard of mariachis! We present to you the Badass Bloody Mary Brunch. You wanted unique brunches, you get unique brunches! With a selection of Yunnan xiaochi (little eats), such as the Yunnan pan fried sausage and potatoes and/or veggie cucumber salad tossed in southern spice, paired with a discounted “Badass Bloody Mary” (first one 25 RMB and every one after 35 RMB), there’s no wonder Slurp! has one of the most unique brunches in town. Once your hangover is gone, switch to one of their tangy screwdrivers to get the party started all over again. This one is not for the faint of heart and those on a limited budget. Let’s keep it simple or things might get messy: 8 courses – check. Unlimited tempura and shashimi – check. All-you-can-drink sake and sake based cocktails – check. Option for all you can drink champagne – check. Classy ambiance in an international setting – check. 688 RMB per head – check. If you love Japanese cuisine and a good brunch, and just got a big promotion at work, this is definitely the place for you. This one is pretty special. La Bota really kicks things up with its renowned Big Paella Brunch. It’s exactly what it says it is: a ginormous, steaming, iron pot topped with yellow rice, octopus ink black rice, seafood, meat and splash of limon. The only thing not making a splash is its nice price of only 88 RMB. Add 100 RMB and you get unlimited refills of sangria or imported Spanish white wine. This is one of my personal favorites, not only for the delicious cuisine, but also for the lively atmosphere. OK, we said that we would only present our unique brunch favorites, so any of you out there who have already been to the Egghead knows that it’s your standard breakfast and brunch diner. The only difference is they serve breakfast and brunch favorites all day, and they (of course) have an open bar with a good selection of beers. For less than 100 RMB you can get a massive specialized omelet, a flavored bagel smothered with your choice of cream cheese, a fruit salad and bottomless coffee. If you can still fit more into your stomach afterward and it’s Saturday, head to Dogtown right next door to see if they’re offering they’re infamous free 12:00 noon keg.